Today’s feature dwelling is a hybrid. 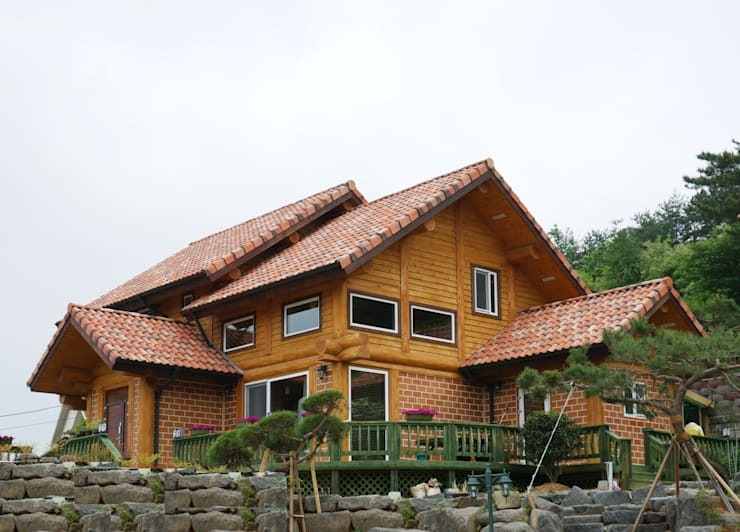 Designed by a South Chungcheong Province-based team of architects, this home is a fabulous juxtaposition of traditional Korean architecture against modern features and inclusions. Nestled into the side of a hill, the property receives enviable panoramic views of the valley below, while its two-storey setup offers plenty of space for the entire family. Characterised by its combination of timber and brick, this popular construction option allows the home a sense of rigidity and sturdiness, while still evoking a warm and welcoming aesthetic. Our first view of this striking home is from just below the ground level. From this vantage we're perfectly poised to check out the way the architects have included a gorgeous combination of both timber and brick. 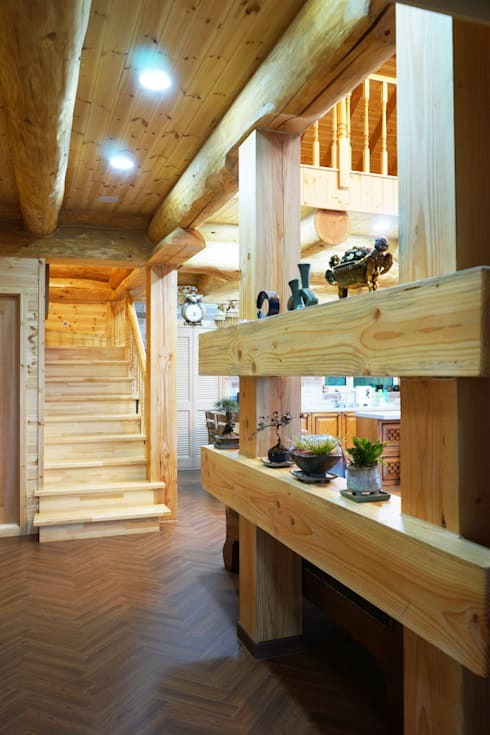 This is rather common in Korean homes, and offers a sense of rigidity, while still evoking and exuding the beauty of the natural timber. 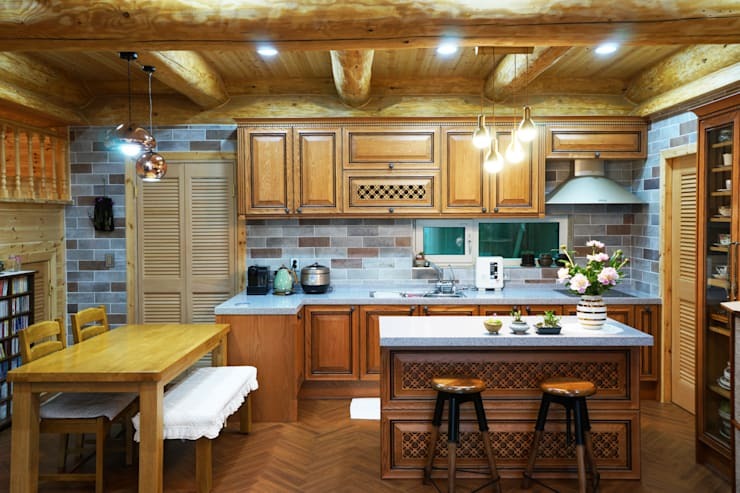 Elegant yet unfussy, the use of the timber beams signifies a cabin-esque aesthetic, appealing to those who wish to pay tribute to the abode's rural location, while embracing certain modern amenities. A hybrid dwelling that encompasses both tradition and contemporary features, the house is perfect for its occupants as it provides an aura of history and heritage, boosted by modern essentials and updating living formats. From this perspective we're able to peek at the exterior terrace, which ensures the house's occupants have a comfy, usable and versatile outdoor space. Ideal for entertaining, as well as more private relaxation, the wraparound verandah is rustic, practical and a standout element in this home's design. Wow! Inside the home we are certainly taken aback by the wonderfully bright and well-illuminated interior. Gorgeously clad almost entirely in timber, this open-plan living space really appeals to those with discerning aesthetic sensibilities. Parquet flooring is a tough yet alluring choice, and is paired with a range of provincial furniture, elegant antiques and versatile accessories. Exposed timber beams complement the wall cladding, offering a sense of rustic refinement, with a timeless and enduring quality. 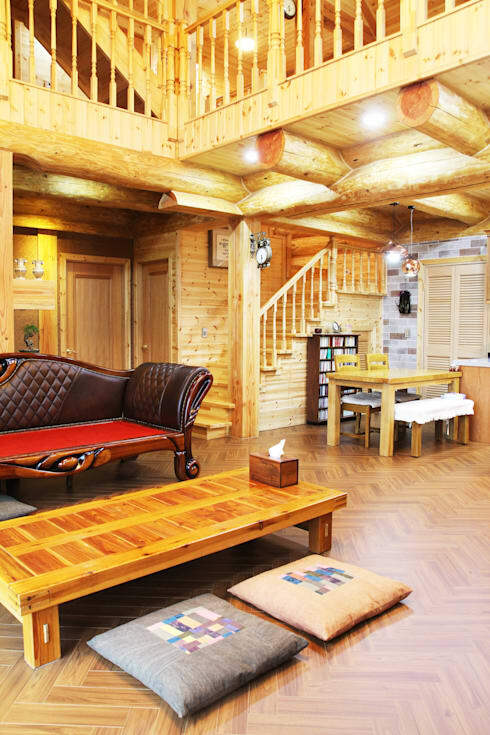 What do you think, do you like the extensive use of natural materials within the home? Turning around to check out the living room we see the large windows that provide the home with ample illumination. Although we are unable to see the view, we're sure it's fairly impressive thanks to the terrace that hangs over the valley below. The lighting is another noteworthy feature. Added to enhance the natural light, a range of downlights and uplighting has been installed in various areas throughout the room. Snug, cosy and perfect for gathering the entire family, this room really shines! The kitchen planners have done a wonderful job with this characterful space. Timeless and provincial, the room is useable and ideal for any culinary hopefuls who intend to create their gastronomic masterpieces. A central island adds an informal eating space, while the dining room sits just adjacent. Snug and serene, this cosy bedroom ticks all the boxes. Heavy drapes provide privacy, while ensuring one can sleep in late into the day if desired. 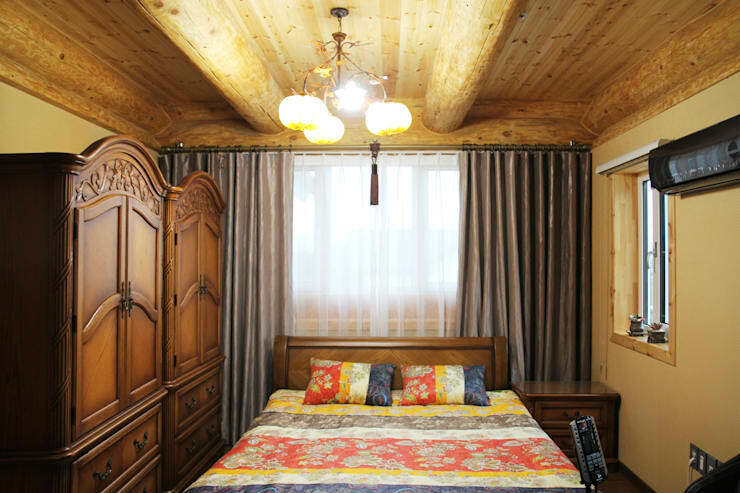 Exuding a chalet-chic ambience, the room is romantic and comfortable, as well as feeling tastefully decorated. Traditional inclusions are seen throughout the home, and this is quite visible in the entrance foyer. Vertical timber columns are paired with horizontal pieces to offer a shelf to adorn with curios and inviting accessories. 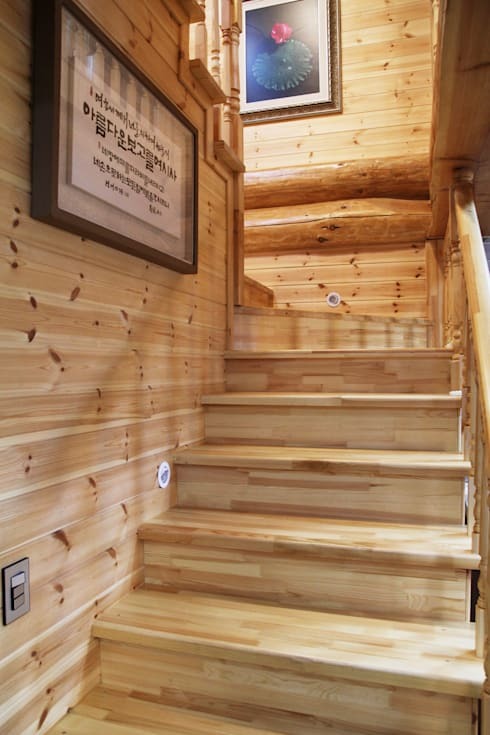 Last up, we take a peek at the staircase, which once again is clad and constructed entirely in timber. 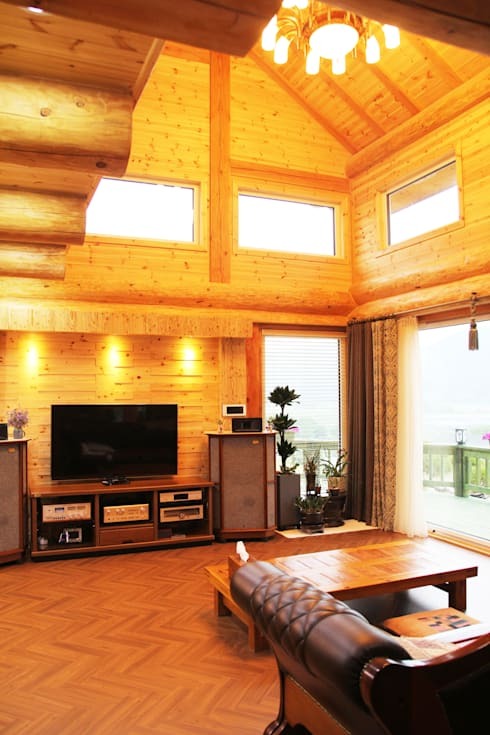 If you think you can have too much timber in a home, think again! 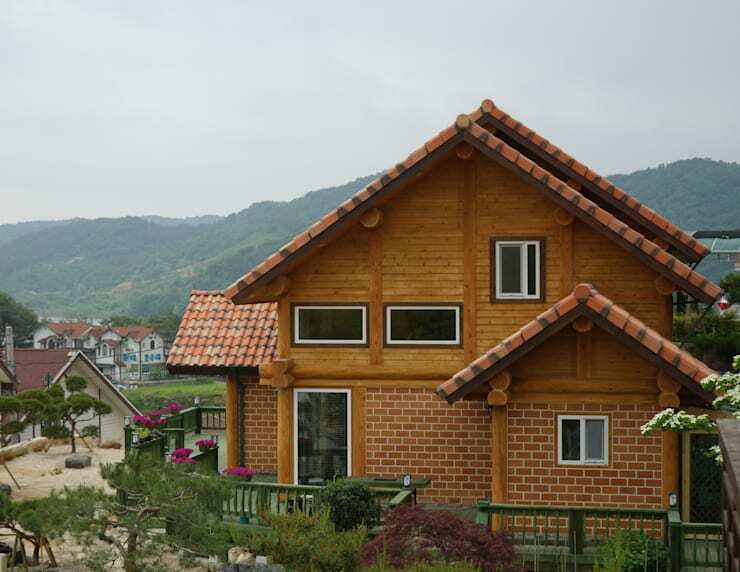 This dwelling embraces natural materials, ensuring they work in a warm, welcoming and hospitable fashion. What do you think of this home's timber interiors?